BONA FIDE SUPERSTAR: The mighty Scotch Notch scores one of her many wins at Moonee Valley with Graeme Lang in the sulky. AS PART of the Mares Month of May, which includes the Mares’ Triple Crown at Tabcorp Park Melton, www.nationaltrotguide.com.au is producing features on some of harness racing’s leading ladies. Proudly supported by world-renowned breeding establishment Alabar Farms, the articles will focus on champions of yesteryear such as Robin Dundee to modern day idols like Adore Me. SEVERAL years ago we assembled a panel to decide which mare deserved the actual title as Queen Of The Pacific. With the Group One of the same name run at Tabcorp Park Melton last Saturday night (and taken out by another star in Ameretto), we felt there was no better time to revisit which mare was deemed the greatest of all-time as part of our mares’ features. Asked to compile a list of the 10 best mares – pacers and trotters – to have raced in the Pacific, the judges came up with some obvious, and a few surprising, results. As it stood only three names appeared on every list – Blossom Lady, Scotch Notch and Tailamade Lombo. On the other side of the scale, Bat Del, Broadways Best, Foreal, Haughty, Hilarious Guest, Misty Maiden, Richmond Lass, Roma Hanover, Sabilize, Stellar Frost and Tuapeka Star only received solitary mentions. But which wonder owns the overall bragging rights as the Queen of the Pacific? Former champion square-gaiter Scotch Notch got the nod, scoring a narrow victory from New Zealand pacer, Blossom Lady. Without doubt the Queen of Trotting, Scotch Notch polled 54 votes to Blossom Lady’s 53. Robin Dundee was third with 46 points, followed by Tailamade Lombo on 38. Interestingly, three trotters polled well, with Scotch Notch joined by Pride Of Petite and Gramel. Scotch Notch headed three lists compared to Blossom Lady’s two, with Robin Dundee and Victor Supreme topping the remaining tables. By US stallion Scottish Bret from Ada Glenfern, Scotch Notch was foaled in 1977. Unraced as a two-year-old, Scotch Notch had nine starts at three during the 1980-81 season for two wins, three seconds, a third and earnings of $8125. Initially trained by Eric Dove, Scotch Notch finished fourth on debut at Yarra Glen on April 20, 1981 before registering her maiden win at her third start. Driven by Dove’s nephew, Stephen, Scotch Notch beat Leedri Hanover and Yendarra Pride at Wangaratta on May 29. Scotch Notch then finished second behind triple Derby winner, Super Spree in the South Australia Trotters’ Derby after breaking on the home turn. She was then third behind Super Spree and Joanie Toliver in the Victoria Trotters’ Derby at Moonee Valley on July 4 in what was her last run for Dove. Just days before the Derby, Jim Wong paid $20,000 for the promising, but erratic filly. Transferred to Lang’s stable, Scotch Notch showed an instant improvement after a few minor adjustments. “She’d had a few starts and was inclined to gallop, but Eric had a high opinion of her and said she was pretty good,” Lang recalled. “In her runs she had shown plenty of speed in some of her sections and I thought she was worth a try. The new connections gained an instant return for their outlay when Scotch Notch won the $7500 Victoria Trotters’ Oaks at Moonee Valley on July 18. Scotch Notch raced in the ‘death seat’ for most of the 2400m journey before registering a three-metre win from Downsouth Clare and Joanie Toliver. Her rate of 2:08.6 was 1.3 seconds quicker than Super Spree posted in the Derby. While Lang is listed as the trainer, most of the credit for the classic success belongs to Dove. “I got her on the Thursday, shod her that night, she was already in the Oaks, so I just kept her in,” said Lang. Finding Super Spree too good once again, this time in the New South Wales Trotters’ Derby on July 27 when finishing a half-head second, Scotch Notch was then sent for a spell. Scotch Notch raced 13 times the following season for 11 wins, a second and $22,504, placing her third behind Big Jake and Courting Appeal as Australia’s top trotting earners for 1981/82. Making a smooth transition through the grades – winning her last seven starts before being sent to the paddock – Scotch Notch also time trialled at Geelong during the term. The mare stopped the clock in 2:01.4, which was Australia’s fifth fastest mile by a square-gaiter and the second fastest by a mare. Her time was only two-tenths of a second outside Gramel’s record set at Harold Park in 1964. It was Scotch Notch’s five-year-old season which gave true notice of her greatness, with the square-gaiter securing the first of her Inter Dominion wins. Continuing her way through the grades upon her return, Scotch Notch was also pitted against the clock twice, with her results outstanding on both occasions. The first was a 1:58.3 mile at Moonee Valley on February 5, which was a record for an aged mare on a five-eighths circuit. Scotch Notch’s time was a tenth of a second inside American mare Speedy Volita’s world mark, and easily bettered Gramel’s long-standing Australian record of 2:01.2. She then claimed another record at Geelong on February 13. In an attempt to beat 1:59.6, the world record for an aged mare on a half-mile track, Scotch Notch stopped the clock in 1:58.6. Only Nevele Pride, which recorded 1:56.8 at Saratoga in 1969, had gone quicker. Scotch Notch was then aimed at the Auckland Inter Dominion in what appeared to be an ambitious goal by Lang. The master horseman proved his judgment was spot-on when Scotch Notch beat Jenner by six lengths, with Sir Castleton a neck away third. “The Auckland Inter Dominion was her greatest win as she wasn’t all that comfortable going the other way, so to overcome that was a big effort,” Lang said. Her Inter Dominion triumph was the first by an Australian-bred trotter in New Zealand, and only the second in 14 editions of the series. Scotch Notch’s success also saw her become the first Aussie trotting mare to break the $100,000 barrier. Returning home, Scotch Notch continued her winning run with another hat-trick, with her triumph in the E B Cochran Cup making her Australia’s richest trotter, breaking Touch Merchant’s mark. Given a well-earned stint in the paddock, Scotch Notch returned for another successful campaign during her six-year-old term, which netted more features and records in Australia and New Zealand. Among those wins was the Dominion Handicap and two Inter Dominion heats, but it was one of her defeats which will long be remembered. Facing the pacers in the prestigious Kilmore Cup, Scotch Notch finished a creditable second in Australia’s richest country cup. Grabbing the lead on the home turn, Scotch Notch was unable to hold out the Bob Knight-trained Distant Thunder, which won by three metres. “I always blame myself for that as I didn’t drive her like the champion she was,” said Lang. “What I did was treat her like she wasn’t up to those top pacers, but she was. Scotch Notch also finished second to Sir Castleton in the Adelaide Inter Dominion. With her season hampered on several occasions by a bowel complaint, Scotch Notch was scratched from the Australasian Trotters’ Championship after the Inter Dominion and sent for a spell. The next season – her last in Australia – Scotch Notch was again the measuring stick for square-gaiters. In her first run as a seven-year-old, Scotch Notch gave pacing mares a 25-metre start and a beating at Moonee Valley when driven by Lang’s son, Gavin. Registering numerous wins during her campaign, Scotch Notch was again set for the Inter Dominion – this time at her home track, Moonee Valley. Arch-rival Sir Castleton beat her by a metre in the first heat before she won her second qualifier with ease. Scotch Notch and Sir Castleton staged another titanic duel in the $30,000 Final – their seventh during a three-year period. History shows Scotch Notch etched her name in the record books as the first trotter to win two Inter Dominions, with her win over Sir Castleton and Super Spree. A week later, Scotch Notch showed her great versatility when she time-trialled over a mile in 1:55.6 before a crowd in excess of 40,000. The champion covered the quarters in 28.2, 29.5, 28.7 and 29.2 seconds to become the fastest trotting mare in the world. “She was just amazing that night,” Lang said. Such was the magnitude of Scotch Notch’s time, it stood until November, 2010 when Sundons Gift, trained by Lang’s son, Chris, covered the mile in 1:54.3 at Menangle. “I can only imagine what she could do around Menangle,” Lang declared. Lang then made a shock announcement when he declared Scotch Notch would race in America. “The handicapping here was the catalyst in our decision to send her to America,” Lang said. “She’d won off 60 metres in the Trotting Championship and we knew 70 would be next, then 80 and it was getting too much. Scotch Notch left the Southern Hemisphere with 47 wins and 18 placings from 74 starts for earnings of $337,365. Scotch Notch contracted a virus soon after arriving in the US, which greatly upset her training routine at Mike Gagliardi’s Lakewood Farm in New Jersey. A half-interest in Scotch Notch was sold just before her first race – where she finished sixth – for $US200,000 to an American breeding syndicate. She raced in the US for two years before being retired to stud at Englishtown, New Jersey. Scotch Notch opened her US account at Garden State Park, New Jersey, on September 23, 1985, when she won a $12,000 Free-For-All, trotting 1:57.2. It was the fastest winning performance by an Australian, or New Zealand-bred trotter, eclipsing the 1:57.6 set by Precocious Land at The Meadowlands in 1983. Scotch Notch then smashed the world trotting mares’ record on a half-mile circuit when she won in 1:58.6 at Yonkers Raceway on October 25. The mare had 16 starts in the US during 1985 for six wins, six seconds and a third, picking up $116,050. As a nine-year-old, Scotch Notch raced 15 times for five wins, five seconds, two thirds and $149,449. Scotch Notch equalled her best time of 1:57.2 at The Meadowlands that year. In September, 1986, it was announced Scotch Notch had made a successful racetrack comeback, only six months after fracturing the cannon bone in her near-hind leg. Following two re-qualifying wins under the American system, the Australian wonder mare scored first-up on September 5 in a record 1:59.3. Disaster struck when the mare suffered another leg injury towards the end of the year. Three pins were inserted in her leg, with Scotch Notch served by Kentucky Futurity winner, Flak Bait, during her time off. Failing to conceive, Scotch Notch was put back into work, with her 10-year-old campaign resulting in eight wins. 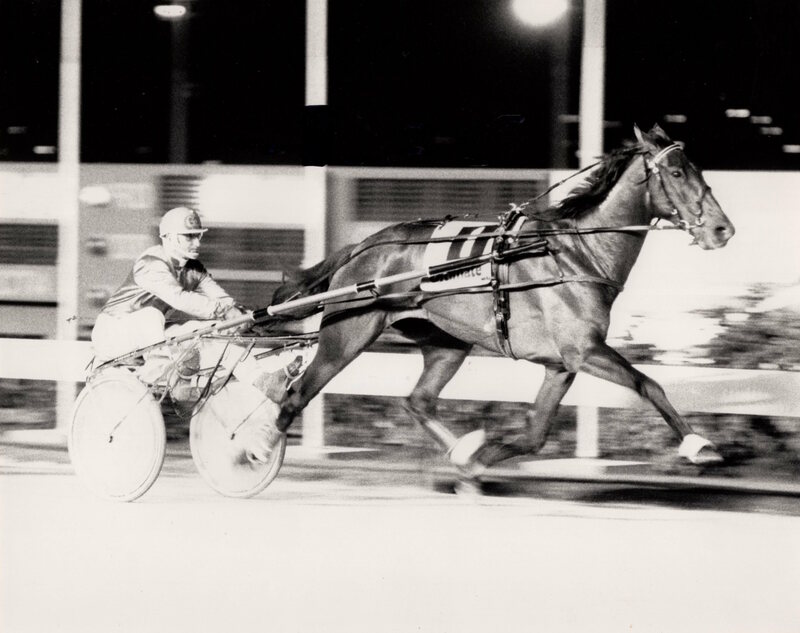 “She won more races on half-mile or less tracks breaking two minutes than any other trotter in the world,” Lang said. Retired at the end of the year, Scotch Notch was sold back to Lang and Wong, who promptly returned the champion and her colt foal by Speedy Crown to Australia. Scotch Notch had 60 starts in the United States for 19 wins, 21 placings and earnings of $335,899. This gave her the phenomenal world-wide record of 134 starts for 66 wins, 29 seconds, 10 thirds and $670,755. Who will claim top honours? A big crowd, & after a pre race hiccup preux chevalier was great in winning the inter.